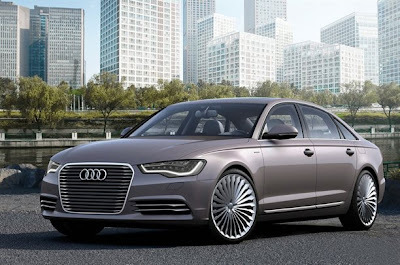 Audi is presenting its first luxury-class e-tron concept car – a technology study known as the Audi A6 L e-tron concept at Auto China 2012 in Beijing. The plug-in hybrid has a powerful drive system that enables a driving range of 80 km (49.71 miles) on pure electric power, and it was specifically designed to fulfill Chinese needs. The A6 L e-tron concept is an important step towards future electric mobility in China for Audi. With its first e-tron technology study in the luxury class, the company is showing what a locally produced New Energy Vehicle from Audi might look like. 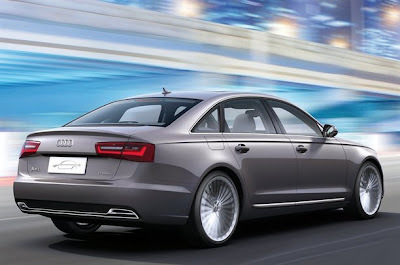 The basis for this study is the new A6 L, the most successful premium automobile and Audi’s bestselling model in China. Audi produces this business sedan at the Changchun plant in a joint venture with FAW. The A6 L e-tron concept is precisely tailored to the requirements of Chinese customers. Plug-in hybrids that can travel long distances electrically – thereby enabling zero emissions driving in local areas – are ideal for use in rapidly growing megacities. Beyond its drive system, the A6 L e-tron concept has all of the qualities that customers value in Audi cars: prestige, comfort and sporty performance. Parallel hybrid system: intelligently combined TFSI and electric motor The technology study is a parallel hybrid. It brings together a 2.0 TFSI that outputs 155 kW (211 hp) and an electric motor with 70 kW (95 hp) peak power. The liquid-cooled lithium-ion battery is located in a collision-protected space at the rear of the vehicle. In electric mode, the Audi A6 L e-tron concept can travel up to 80 km (49.71 miles) at a constant speed of 60 km/h (37.28 mph). At any given moment, the hybrid control module chooses the best suited operating mode with the focus on driving range. This technology platform can be operated with only the internal combustion engine, only the electric drive, or in hybrid mode. In addition, it can recover energy during deceleration, or it can boost output power for strong acceleration by combining the two drives. The Audi A6 L e-tron concept delivers sporty performance. Setting a course for the future: Audi’s e-tron strategy The rapid advance in urbanization and the associated need to reduce CO2 emissions are a key determining factor for new drive technologies. Audi views electric mobility as a key future technology and is working on highly efficient solutions that simultaneously offer the customer a typical Audi driving experience. Audi has already launched electrified drive systems in volume production with full hybrid models that have highly advanced lithium-ion technology. The Q5 hybrid quattro, A6 hybrid and A8 hybrid can drive up to three kilometers (1.86 miles) on electric power. In combined mode, which uses the internal combustion engine and electric motor, customers experience sporty driving performance and significantly better fuel economy. The next step is to implement drive systems in which electric driving is the primary focus. The term Audi e-tron refers to technologies ranging from PHEV (Plug-in Hybrid Electric Vehicle) to range extenders and finally vehicles powered purely by electric batteries or fuel cells. In its first Audi e-tron concept car, Audi already showed how this future might look. And in the case of the R8 e-tron, this vision will be realized in a short production run later this year. Audi is using A1 e-tron and A3 e-tron test vehicles to acquire important customer feedback, which can be incorporated in later production cars. The first product will be the A3 e-tron in 2014. It will be followed by other New Energy Vehicles. In this way, e-tron will become established as a further attractive drive technology option alongside TDI and TFSI. The Audi A6 L e-tron concept is notable for its elegant styling. The sedan, which has a 3.01 meter (9.88 feet) wheelbase, is 5.02 meters (16.47 feet) long and 1.87 meters (6.14 feet) wide, but only 1.46 meters (4.79 feet) tall. Its long engine hood, its low, extended roof line and the sharp lines on its sides create an athletic overall look. Characteristic Audi LED headlights emphasize the car’s determined expression. The car’s exterior styling shows its differences from the production car. At the front, the single-frame grille with its slender cross-bars and the nearly covered air intakes attract the eye – both features are typical of all e-tron models. Powerful 21-inch wheels in e-tron design and the special rear diffuser highlight the car’s progressive character. On the body, signatures identify the prototype’s technology, while under the engine hood a styling capsule covers engine components. A ribbed contour at its center symbolizes the hybrid drive. Lightweight and strong with Audi ultra: the body The body of the A6 L e-tron concept is identical to that of the Audi A6 L. It is lightweight, rigid and safe to a maximum degree, due to application of the ultra lightweight principle. Consisting of approximately ten percent aluminum, it weighs about 15 percent less than a comparable all-steel design. Aluminum components in the load-bearing structure and exterior skin, as well as the high-tech steels used in the occupant cell, make the body significantly lighter. Each new future Audi model will be lighter in weight than the previous model. This makes the brand a frontrunner in reversing the upward weight spiral. In designing car bodies, developers will intelligently use new combinations of materials, including carbon fiber-reinforced polymer (CFRP). For Audi, ultra lightweight construction does not solely focus on one material, rather it seeks a flexible approach that utilizes a wide variety of materials – but with one goal: to attain the best performance with the least material usage at the best places. Furthermore, advanced materials and construction methods achieve an extremely low sound level in the interior of the Audi A6 L e-tron concept. Excellent vibration comfort is attained by fine-tuning components and by hydraulically damping axle and drive mounts. Audi’s ultra lightweight construction competence is also found in the chassis, which combines a high level of comfort with sporty handling. The links are made of aluminum. The power steering, like the brake booster and the air conditioning compressor, utilizes an electromechanical drive. At the limits of performance in driving through curves, the electronic transverse differential lock – a function of electronic stabilization control (ESC) – stabilizes the Audi A6 L e-tron concept by making small interventions at the front wheel on the outside of the curve. As in the Audi A6 L before it, the interior of the technology platform continues the elegant styling of its exterior design. Its defining element is an arc under the windshield – the wrap-around – that surrounds the driver and front passenger. The front of the instrument panel is designed in the form of a flowing wave. All of the interior details illustrate the aesthetic standard with which Audi builds its vehicles. All materials have been carefully selected and meticulously worked into the design. The controls are intuitive. The powermeter replaces the tachometer; its pointer indicates total drive system power on a scale of zero to 100 percent. Colored segments indicate the current operating state of the A6 L e-tron concept; an auxiliary instrument visualizes the charge state of the lithium-ion battery. Meanwhile, the energy flow indicator tells the driver the current operating mode and which hybrid drive components are currently active. It can be called up from the driver information system or MMI monitor. The large screen shows a bar diagram of average fuel economy and indicates the amount of recovered energy over five-minute intervals. The Audi A6 L e-tron concept offers a lot of space at all seating positions. It integrates all of the model line’s luxury-class features. The seats offer ventilation and massage functions, the Bose surround system delivers good sound, and the deluxe automatic air conditioning system with air ionizer ensures a pleasant climate in the car. Ambient lighting adds subtle highlights to the interior illumination. The driver assistance and safety systems also satisfy the highest standards. Audi active lane assist supports the driver in lane-keeping, while Audi side assist helps to change lanes. When it is dark, the night vision assistant highlights detected pedestrians even at a distance; the parking assistant helps in parking. The Audi pre sense system can reduce the severity of accidents and their consequences in many cases. The car’s features also include MMI navigation plus. Many functions of the large hard-drive navigation system can be controlled by touchpad character input; the touch-sensitive pad, MMI touch, recognizes 29,000 Chinese characters. A team of engineers developed these functions at the Audi Infotainment Tech Center (ITC) in Beijing, where infotainment components from Germany are adapted to suit the wishes of Chinese customers.